With a free evening ahead of me, I was looking at a visit to Shifnal Town on the GroundHopping journey. However, an email I received in the morning changed all that. It was from Neil Clarke, the boss at RUK Group, who are the main sponsors at The New Saints FC. ‘One ticket spare for tonight’s game if you want it?’ began the message. 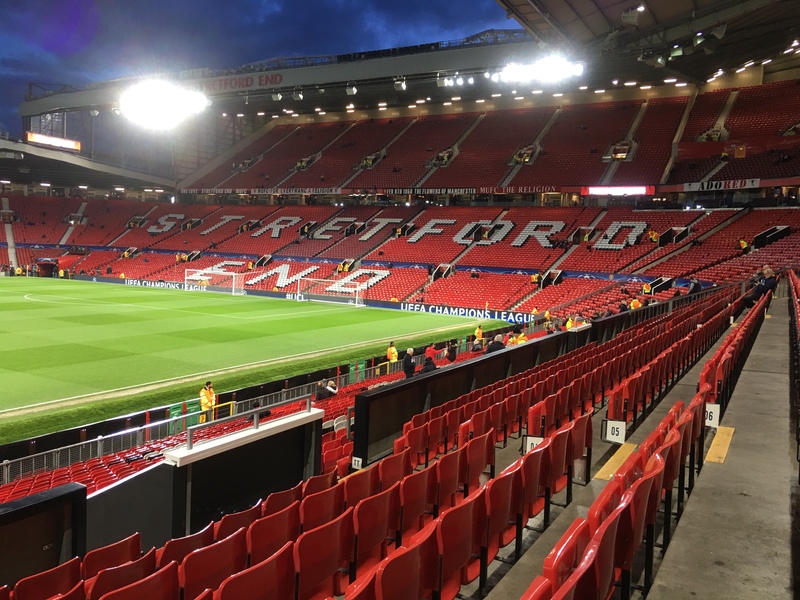 The game in question was Manchester United v Sevilla at Old Trafford. Did I want it? Well, no offence to the West Midlands Regional League Premier Division, but I was immediately rescheduling my day as the Champions League beckoned. Giving myself plenty of time, I arrived a couple of hours before kick-off and did what I always enjoy doing at new grounds – I took a walk around the stadium perimeter. Statues and images highlighting the great history of the club for me personally were eclipsed by a walk through the Munich Tunnel. Words are not needed. The game itself, played in front of 75,000 fans, was a disappointment if you’re a Manchester United supporter. Although they started well enough in the opening minutes, it was all downhill from there as Sevilla grew in confidence. Lacking imagination, creativity and fluidity, it was the Spanish side that took a 2-0 lead in the second period. Although the home team pulled a late goal back, that then prompted them into a passionate spell, unfortunately for the Old Trafford faithful it was a case of too little, too late. It was Sevilla who proceeded to the quarter-finals as the final whistle drew the game to a close. It was my fifth Champions League game of the season and courtesy of the competition, my third new stadium. So far in 2017/2018 that’s 36 new grounds and 138 in total.